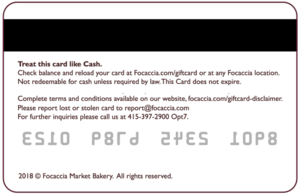 THE FOLLOWING GIFT CARD AGREEMENT DESCRIBES THE TERMS AND CONDITIONS THAT APPLY TO THE PREPAID ACCOUNT OF YOUR CARD. BY USING YOUR CARD, YOU AGREE TO THE TERMS OF THIS AGREEMENT BETWEEN YOU AND FOCACCIA CAFE(C) INC., A CALIFORNIA CORPORATION, AND ITS AFFILIATES. The Card is issued to you by Focaccia Cafe(c) Inc. It allows you to load a dollar value on to your Card for future purchases at participating stores. The dollar value that you load onto your Card is a prepayment only for the goods and services. We reserve the right not to accept the Card or otherwise limit use of the Card if we reasonably believe that the use is unauthorized, fraudulent or otherwise unlawful. The minimum amount that must be loaded onto your Card is $10 at participating stores. The maximum amount that can be loaded is $200.00 at one time. The card balance cannot exceed $200.00. Your Card has no expiration date. Cardholders are not sent statements of itemized transactions from a Card account. 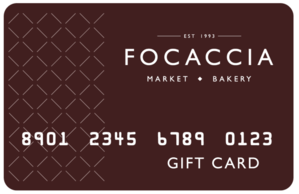 You can check the balance of your Card by visiting our website Focaccia.com/cards Or any Focaccia store. At the point-of-sale register, when you use your Card, you will receive a receipt. The receipt will indicate that the purchase was made using your Card and will provide the remaining balance of your Card. You should keep your receipts and check to ensure that your account balance is correct on your receipt. We reserve the right to correct the balance of your Card account if we believe that a clerical, billing or accounting error occurred. We will conduct an investigation and communicate the results and correct any error that we verify as soon as we finish the investigation. If no error was found, we will communicate an explanation. We shall have no liability for any billing error unless you provide us notice within 60 days of the date of the transaction in question. You should monitor your transactions and account balances closely. Because your Card is used like cash for purchases from Focaccia Cafe(c) Inc., you are responsible for all transactions associated with your Card, including unauthorized transactions. If your Card is lost, stolen or destroyed, the Card cannot be replaced. We may amend the terms of this agreement at any time, including any rights or obligations you or we may have. Focaccia Cafe(c) Inc., and its affiliates make no representations, warranties or conditions of any kind, express or implied, with respect to the Card, including, but not limited to, any implied warranty of merchantability, fitness for a particular purpose, title, or non-infringement, or any warranty arising by usage of trade, course of dealing, or course of performance. Any dispute or claim arising under this agreement shall be resolved by binding arbitration with a duly authorized representative of the American Arbitration Association ("AAA"). Either the Company or the Card Holder may submit a dispute or claim to binding arbitration before the AAA, which arbitration shall be final and binding on the parties and the exclusive method, absent agreement between the Company and the Card Holder, for resolution of the dispute or claim. The cost of the arbitrator shall be borne equally unless the arbitrator determines otherwise in his/her award; each party shall be responsible for its own costs and/or attorneys' fees.